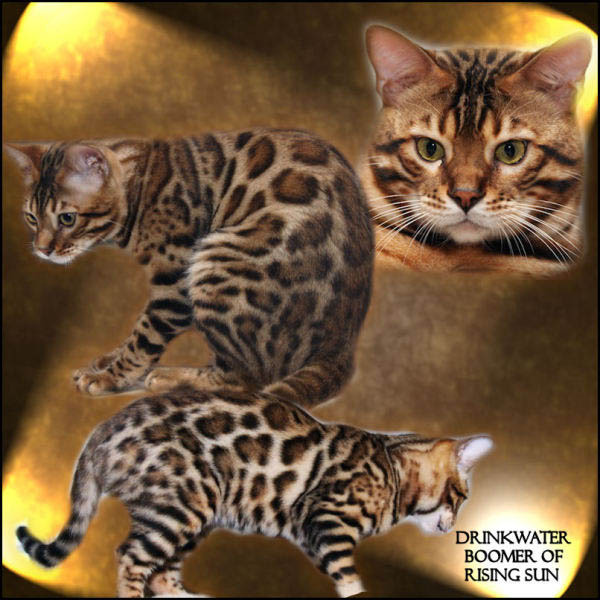 Rising Sun breeds world-class Bengal cats that are recognized internationally as being some of the finest examples of the breed. 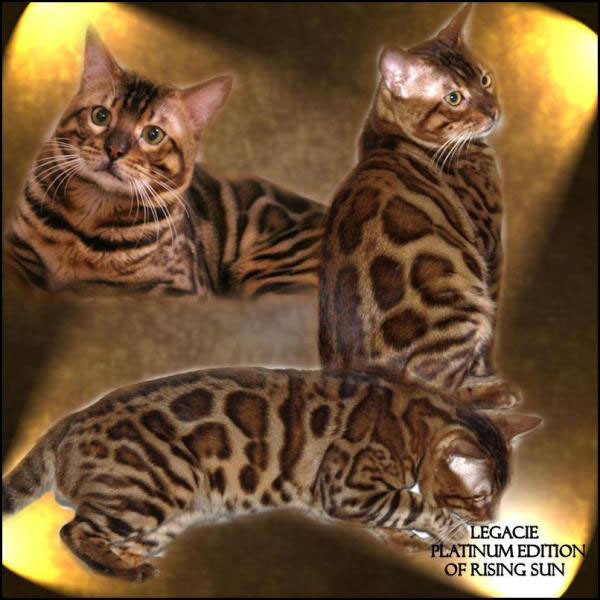 Our Bengals are highly accomplished in show rings worldwide. 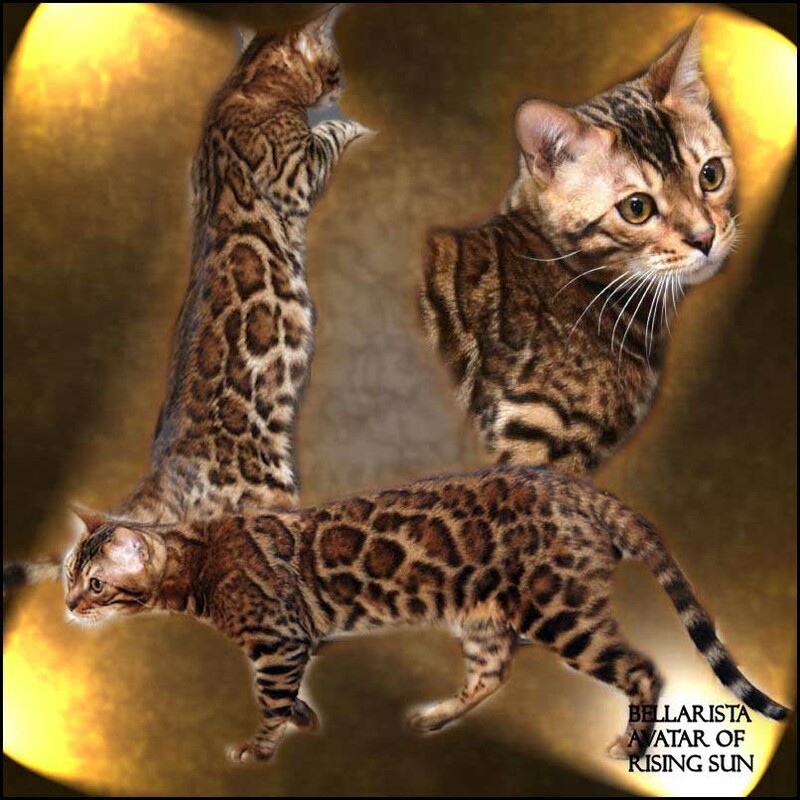 Our goal is to produce healthy, attractive Bengal kittens that we can share as exceptional pets.Rising Sun Bengals are placed in loving homes worldwide. 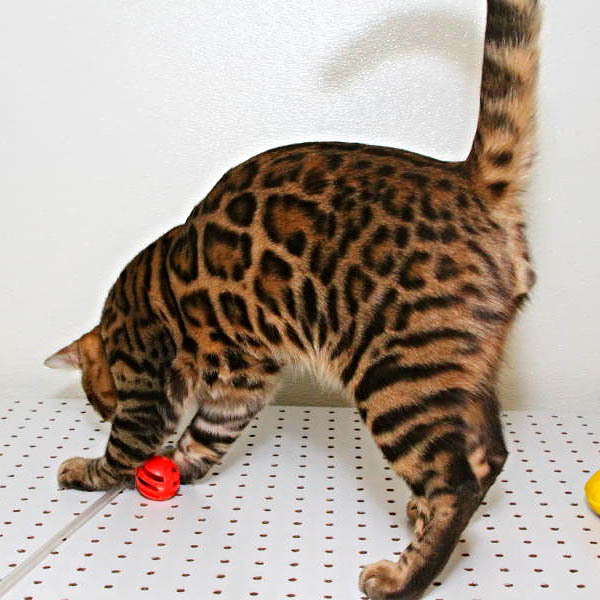 They have proven genetics, head type, bold markings with fun-loving personalities that win championships and make wonderful pets. 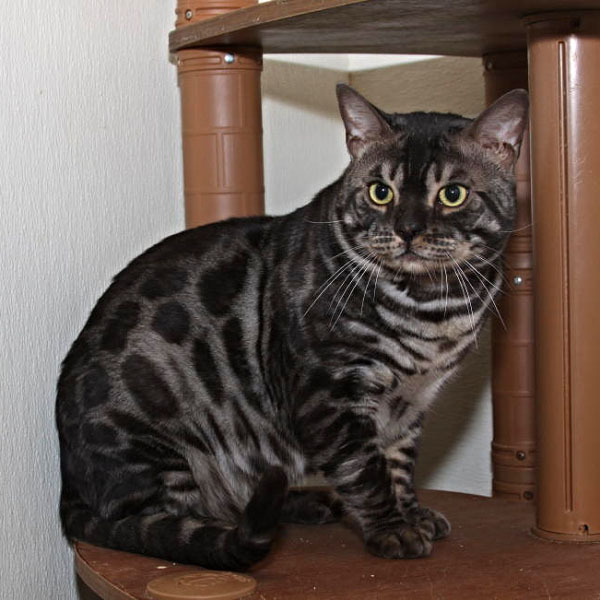 This lovely boy is a stunning brown spotted cat. He has large open rosettes on a light cream back ground. Flash is a big kitten with lovely head type. He has a wonderful out going personality. We are excited at what this King has to offer with our wonderful queens. 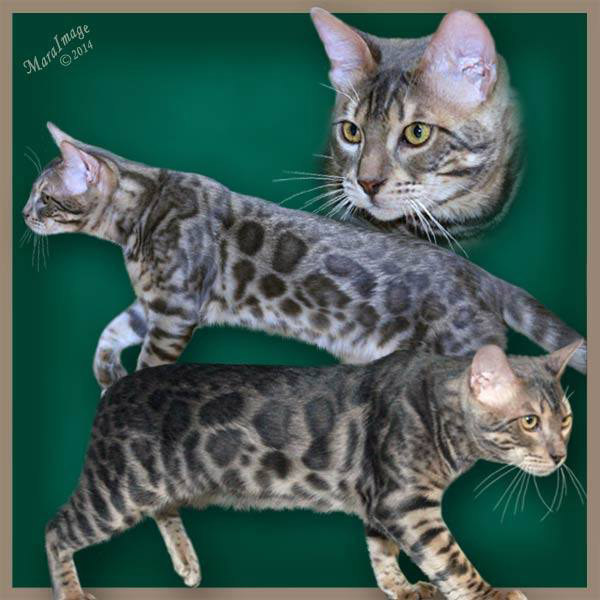 Many thanks to Elena Bolozan at Elysor Bengals for this wonderful Boy. This Outstanding silver boy came to us all the way from South Korea. Slayer has beautiful type and color. 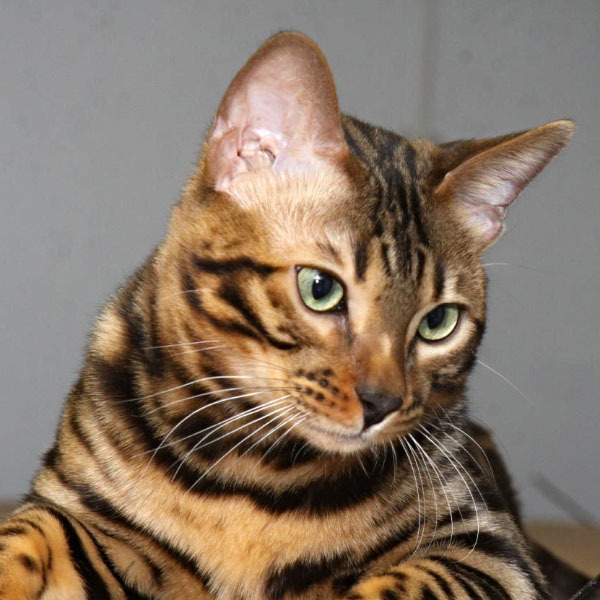 His Temperament is very sweet and affectionate.He has small ears and lovely head type. Thank you Jay at BGMON for this super boy. 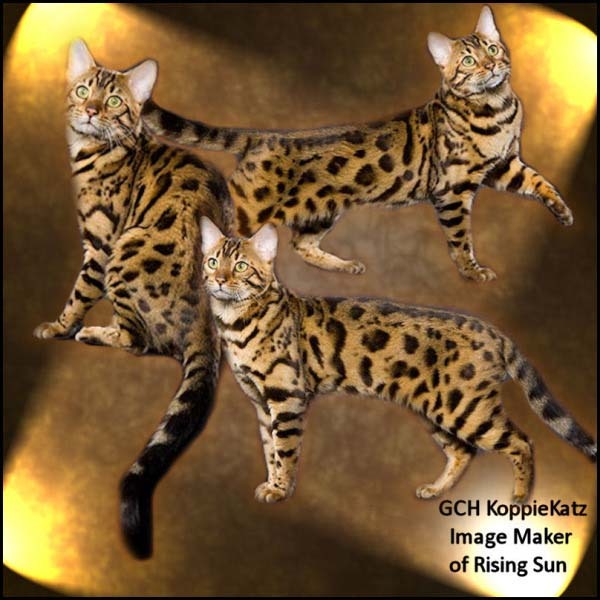 We are looking forward to his future kittens at Rising Sun! 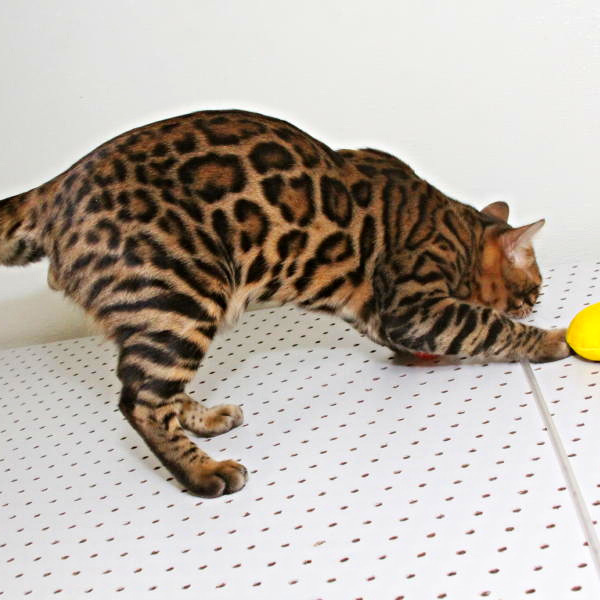 This Outstanding boy has a Striking pattern and amazing color. 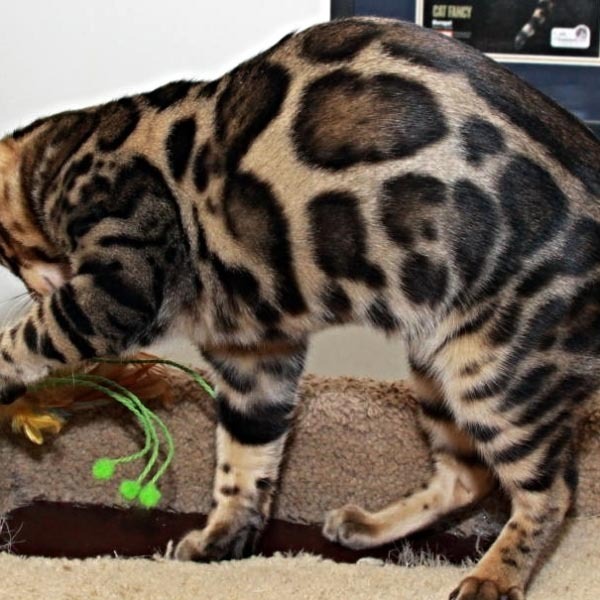 He has the “leopard” look to him. Zipper has a lovely temperament. He has small ears and lovely head type. 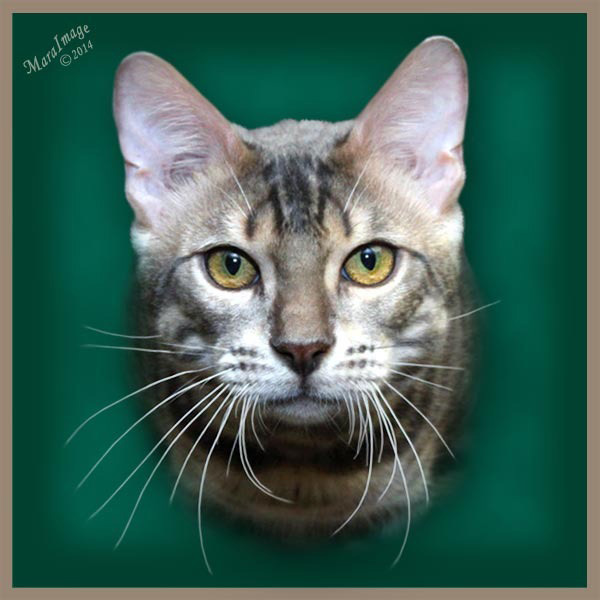 Thank you Liliana of Mango cattery in Russia for this super boy. 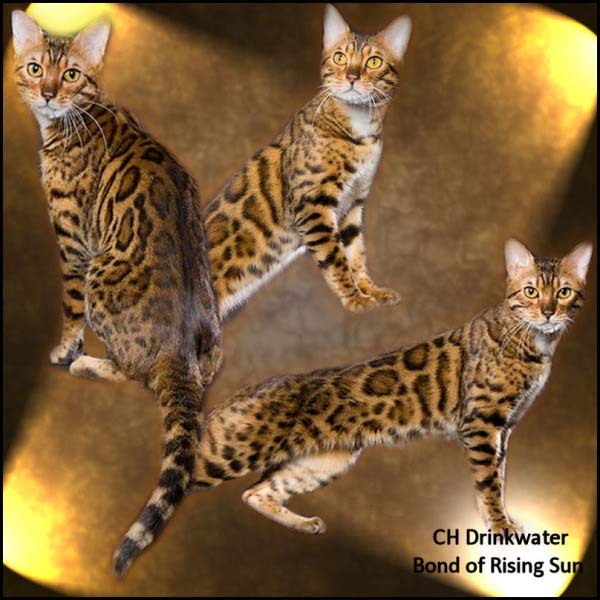 We are looking forward to his future kittens at Rising Sun! 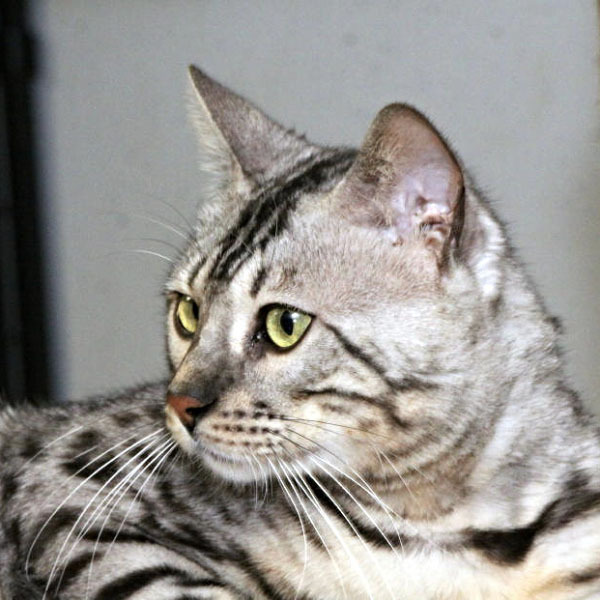 This lovely Charcoal Silver boy is a powerful cat with nice Type,puffy whisker pads and little ears. 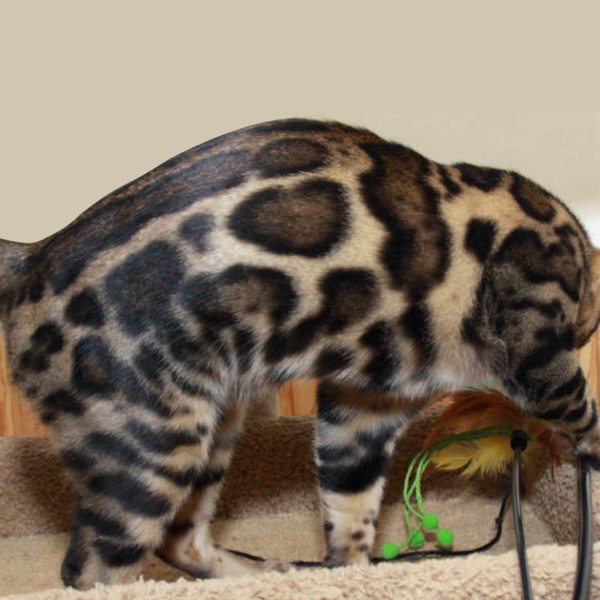 Dillon has a nice flow to his pattern and a soft plush coat like nothing we have felt before. He is easy going and very friendly to be around. This lovely boy will move our program forward. Thank you Sabrina and Mathieu for this lovely boy! 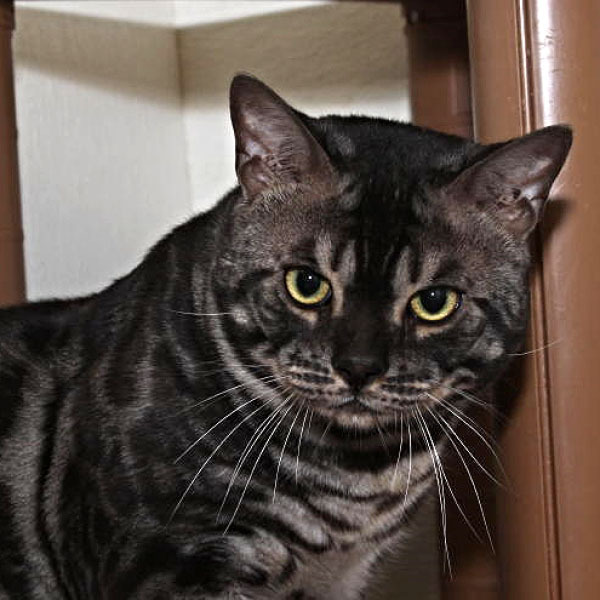 Boomer is a large, powerful cat with a wonderful head type and puffy whisker pads. 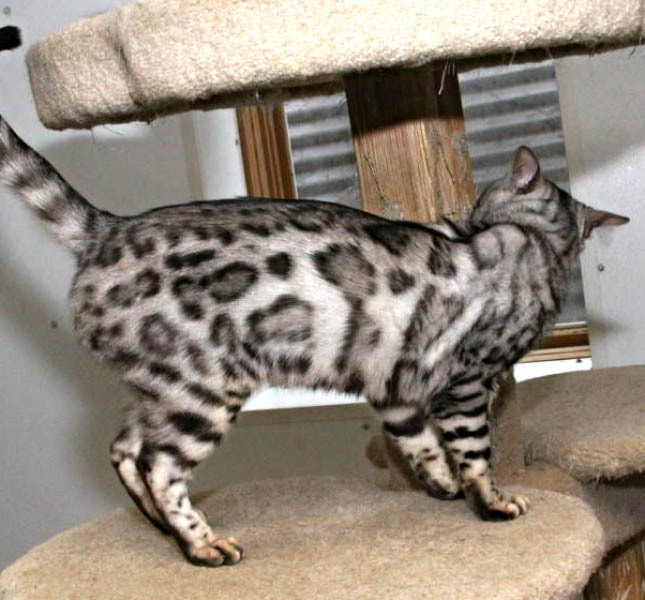 He has a brilliant pattern with large rosettes on a light cream background. He is easy going and very friendly. Thank you Doreen Boileau for this lovely boy! “Eddy” has a rare plush coat that is thick and downy soft. 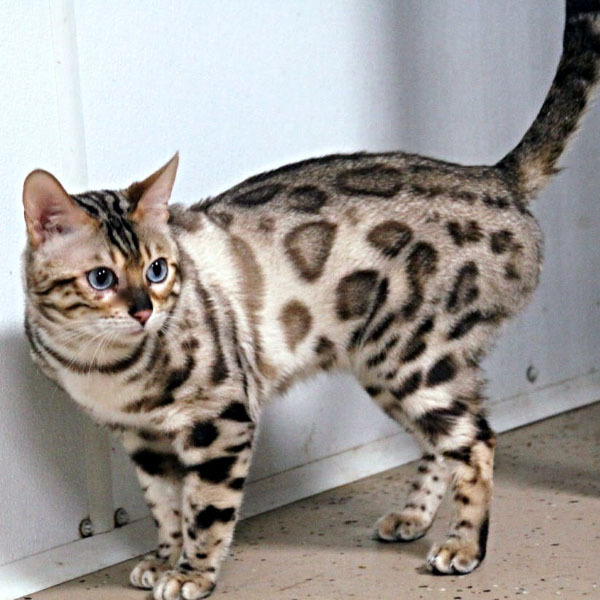 His unique rosette pattern is on a light cream background and gives him a truly exotic look. Many thanks to Jill Orman for our Wonderful Eddy! 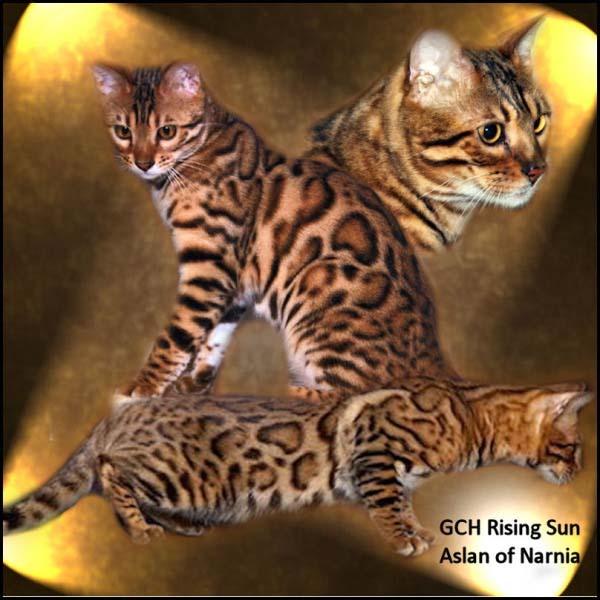 “Avatar” is an outstanding – gorgeous lovely kitten. He has a wonderful pattern with big rosettes and contrast on a light cream background. He has a nice head type with a playful temperament. Avatar caught our eye as a young kitten. We loved the flow of his pattern and rosetting. Thank you Nicole from Bellarista for this wonderful boy. 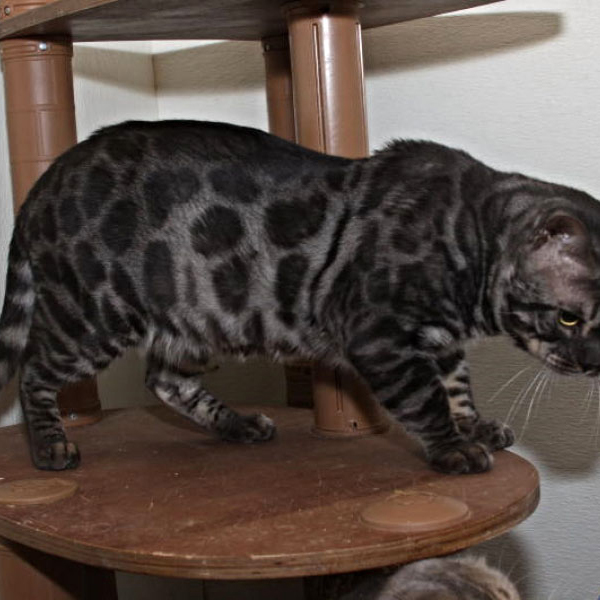 Flurry is an animated Bengal with dark outlined rosettes and plenty of acreage. 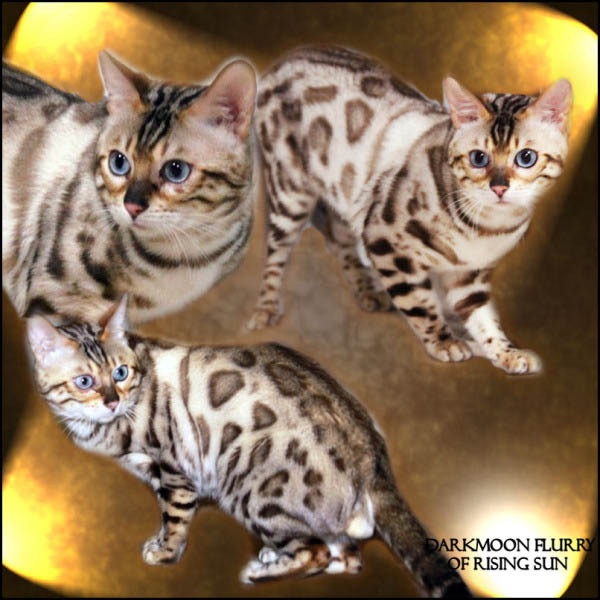 He has beautiful Snow Lynx coloring with brilliant rosettes and deep blue eyes.Thank you Vikie Schenk at DarkMoon for this outstanding cat! Flurry is now in his Forever home. 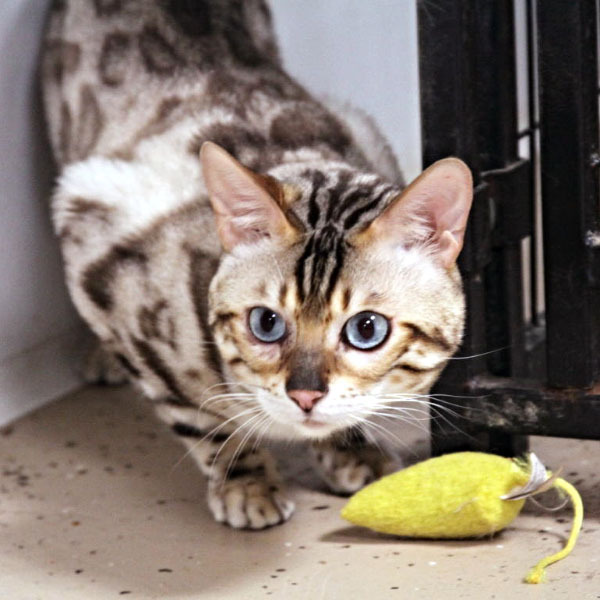 This lovely Blue Spotted boy has wonderful Head Type with puffy whisker pads. 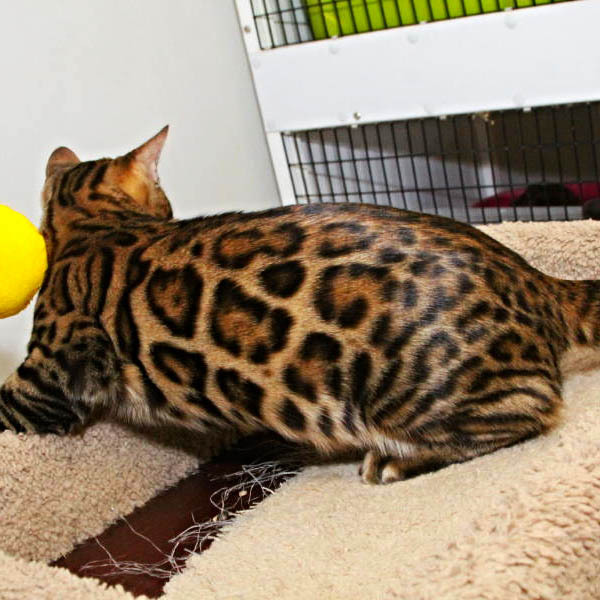 This big strong cat has the most amazing personality of the cattery. Royal produced lovely kittens and is now retired into his for ever home. 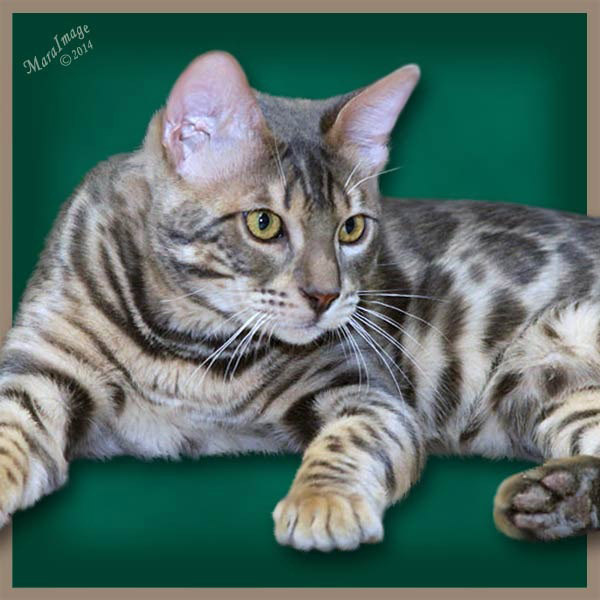 Our first home-bred Grand Champion, Aslan has a beautiful, crisp pattern on his contrasting glittered coat. He has a strong profile and was named Grand Champion after only three shows! Image Maker is an incredibly accomplished cat with a world class pedigree. 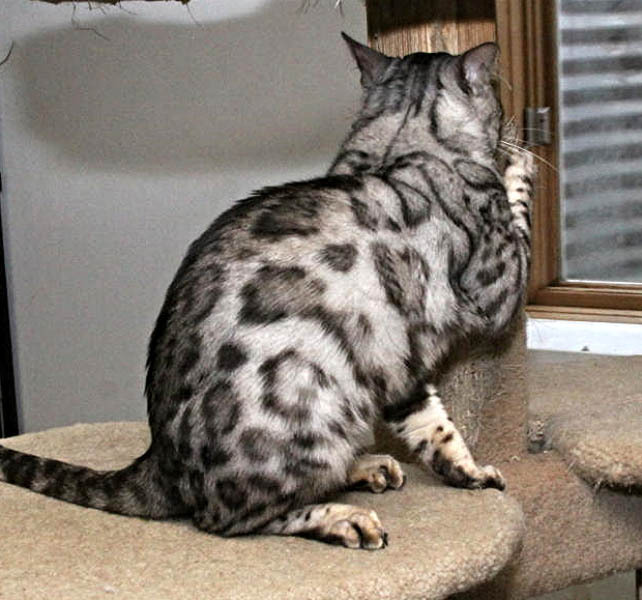 He is clear-coated with a tight, glittered coat. His unique markings are jet black. In his first adult show he placed best in breed four times and finaled 5th, 7th, and 10th best in show! Bond is handsome cat with a powerful, correct body. He has small ears, and a short, thick tail. 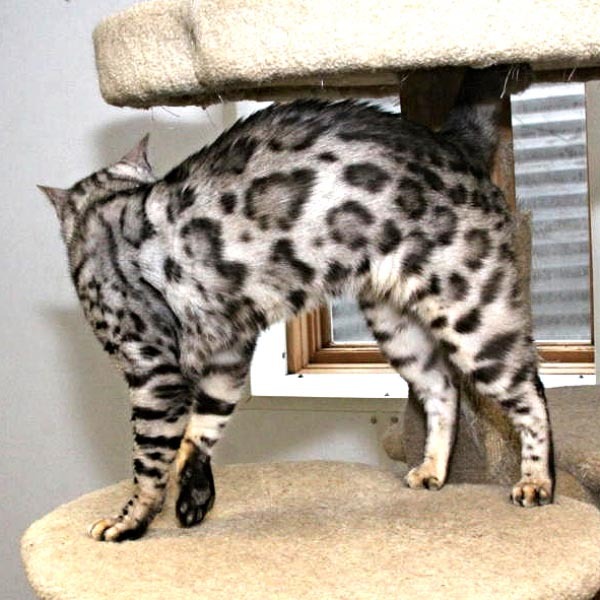 He has incredible contrast and huge rosettes. Bond was an outstanding foundation sire.